Dior bag. It doesn't really matter to me that it's Dior, I just like the design. But I have to admit having a Dior bag sounds tempting. At least I'll know this bag will live forever. Average price of these bags is around $5000 (new collection). Michael Kors bag. I could just copy the text above because my reasons are the same. I love the design of his bags. Average price for these bags is $400. These bags are cheaper than Dior's and I have to say prettier (to me). RayBan sunglasses. I've been in love with RayBan for about 10 years now. As soon as I found out what RayBan is, I knew I wanted their sunglasses. They have top quality glasses for decades and they also have variety of models so you can't say you couldn't find anything for yourself. Average price for these glasses is $200. Get driver's licence. Car and motorbike. I'm actually pretty close to getting it but I can push myself to sing in in driver's school. I was going to get it done this summer, but the way my summer started, I honestly doubt that I'll have my licence by the start of the next year. After accomplishing previous, I would like to buy a BMW (series 1, 5 doors, white) and Kawasaki Ninja (I know both are kinda old models, but they're my dream). Get nail designer licence and open a small salon. Nails are my big love and I want to do nails professionally (aside of college and, in the future, my real job). The course I've been planning to take costs around $450. I also planned to do this this summer. We'll see how it goes. A tattoo. OMG how I want a tattoo. I actually want few of them, all small and meaningful to me. I don't know how much would all of them cost me, but I hope I'll found out soon. Tattoos I like can be found in my "Tattoo" tab. To lose weight. This is not something I can pay for (I could if I were a celebrity) and I can do this any time, but I'm lazy and scared of God knows what and embarrassed... I just have a lot of excuses so we'll leave this for a while. To learn how to play a piano and guitar. My father was a musician in his days and he still plays the guitar. My brother also plays guitar since he could hold it and I... I don't. Since I really love to hear both guitar and a piano melody, I would like to play these instruments. Visit New York. My dream city. More about this can be found in my "New York" tab. Of course, I should fit somewhere in here the wish to finish college, get a job, have a family, etc etc... Not that those are less important but they are regular wishes, I think. P.S. 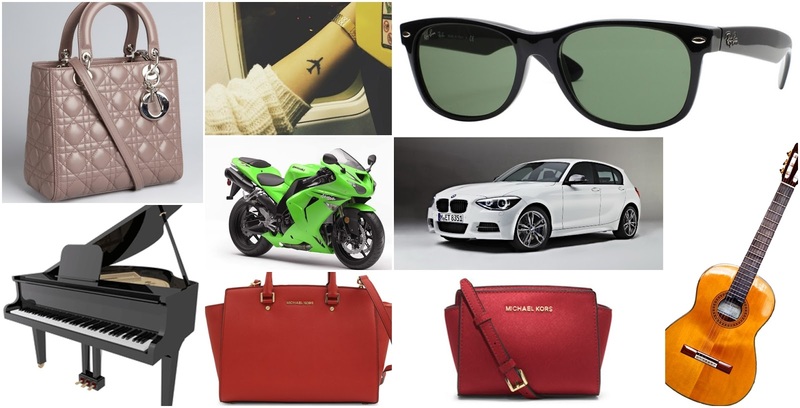 All pictures show exactly what I want (bag designs, glasses type...).